So this weekend I received a surprise to play with from George, the president of the Adelaide Retro Computing group - a stock standard Classic Amiga 500! Thanks mate! The first challenge of course being that it doesn't work and I needed to work out why before I could use it! When I hooked up the Amiga 500 at home with my external scan doubler to VGA converter it flashed the power led and the screen was Yellow. Not a great start! A quick snoop turned up that this particular Amiga 500 is a Revision 5 board, and has a Fat Agnus chipset, meaning it is an ECS machine (not OCS). So I powered on the Amiga 500 again and bingo, I get the insert disk screen - excellent! Next up was trying out the floppy drive, which I quickly found was faulty. Since I didn't have an immediate solution to this, I decided to connect up my ACA500, which I think will be perfect for this Amiga 500! 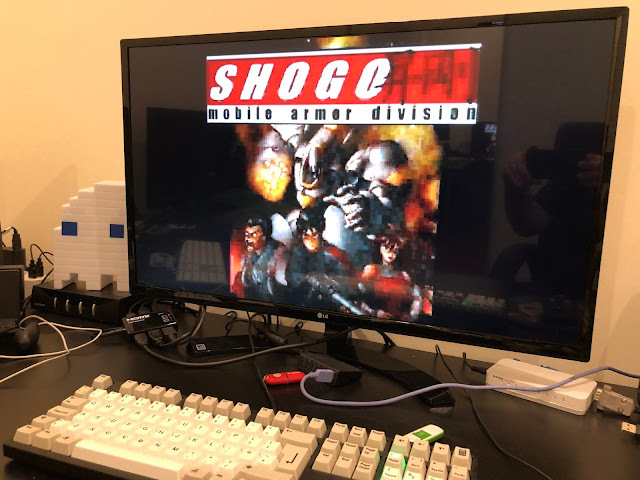 I used this previously on the Amiga 1000 back in this blog post if you would like to see more information about the ACA500. I removed the Denise chip, ready to install the Indivision ECS in it's place and put the Denise chip on top of the Indivision ECS. All connected up now, I then fed the VGA cable through the small gap in the left hand zorro slot expansion and powered on. It worked! Of course this looks so much better! There is still plenty more to do, but this Amiga 500 is already starting to show plenty of promise. More to come in a future blog post! I have fixed these floppy disk drives by running a special floppy with a cleaning fluid in them to clean the floppy heads. It is portuguese, but there's a lot of pics making it quite straightforward to follow. The main thing is that you MUST remove all the internal cloth from the floppy enclosure. You can use some online translator, too. Cheers.